HENRY V – ORIGINAL 1976 THEATRE POSTER – PAUL DAVIS ART SHAKESPEARE IN THE PARK! HENRY V – ORIGINAL 1976 THEATRE POSTER – PAUL DAVIS ART SHAKESPEARE IN THE PARK!Original 1976 Theatre Advertising poster (30″ x 46″) Shakespeare in the Park 20th Anniversary Poster! Poster has some wrinkling and light border wear with small nicks. This poster is overall in Very Good to Fine Condition. Please refer to the accompanying image for a detailed view of this original advertising poster. We are adding new WWI and WWII, advertising and travel posters daily so please check back for new items! 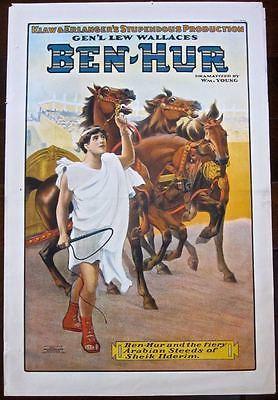 BEN HUR - ORIGINAL 1910 THEATRE POSTER - VERY RARE ROMAN ART STONEBRIDGE LITHO!! BEN HUR – ORIGINAL 1910 THEATRE POSTER – VERY RARE ROMAN ART STONEBRIDGE LITHO!! CUT $30! 1925 SPANISH LB ADVERTISING POSTER - VERMOUTH PERUCCHI - J. ORTEGA ART! CUT $30! 1925 SPANISH LB ADVERTISING POSTER – VERMOUTH PERUCCHI – J. ORTEGA ART!